Peanut had no idea that “special” baked goods exist. But he sure did find out by eating a weed cookie because life is chill. Like us humans, animals tend to be mischevious at times. One animal that goes by the name of Peanut is just one of them. As a matter of fact, Peanut, the Chihuahua, happens to love cookies. So much, in fact, that he will go to great lengths to get one. However, Peanut had no idea that “special” baked goods exist. But he sure did find out by eating a weed cookie because life is chill. Peanut’s name fits him perfectly because he tends to get a little nutty. Although this may be true, Peanut isn’t the first dog to get into anything and everything. In fact, the chihuahua’s owner says that he likes to steal. Specifically, cookies that don’t belong to him. Apparently, Peanut has no fear and will do whatever it takes to get a tasty treat, even if it requires a little sneaking around. For this reason, guests’ belongings in Peanut’s home aren’t safe, especially if they have what he’s looking for. As a matter of fact, a guest did stay at Peanut’s home and even brought a cookie. With this in mind, Peanut had to have it. And he got it alright, with zero manners. Indeed, little Peanut went through the guest’s bag and snatched it right up. However, he didn’t exactly plan on getting super baked in the process. That’s right, Peanut ate a pot cookie. Peanut didn’t just take a bite of the cookie, he devoured the entire thing! According to the owner, a guest stayed the night and Peanut found his stash. Of course, Peanut just thought it was his favorite treat and so he went for it. In fact, the desperate little pup worked extra hard to get the cookie. However, he only expected to be rewarded with a full belly, not an out-of-this-world high. Eventually, Peanut began feeling anxious and quite on edge. Being that he ate the entire weed-laced cookie, it makes sense. In fact, the poor baby is only 6 pounds, so you can imagine just how high he was. With this in mind, his owners rushed him to the nearby vet medical school to have him looked over. Look at him, the poor doggo can’t even keep his head up. 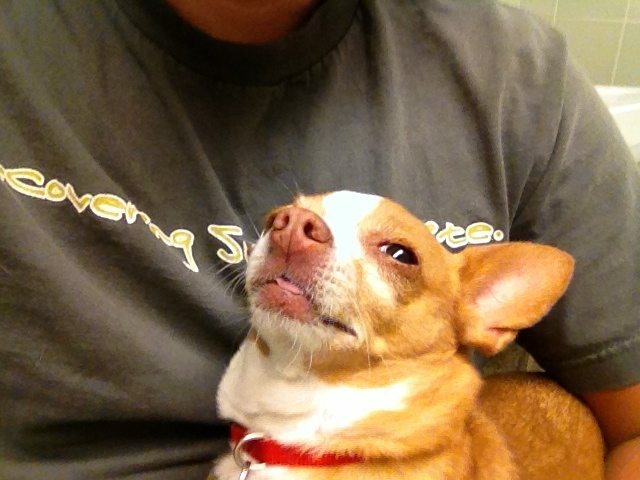 Nevertheless, when the family brought Peanut to the vet they didn’t seem the least bit phased. Apparently, animals like getting stoned, and Peanut isn’t the first to come through the door. All in all, we salute you, Peanut. We know exactly what it feels like to want something so badly that you’ll do whatever it takes to get it. Of course, sometimes our mischevious acts lead us to trouble. But hey, at least he favors the herb over harmful drugs. * Remember, don’t give edibles to your pets. Have your animals ever dug into your weed stash? What are your thought about animals consuming cannabis? Share with us on Facebook, Twitter, or in the comments below. We would love to hear from you.